in’ter-act’, v.i. to act upon another. That’s Leonard Knight talking. He speaks with a faint New England twang, and his eyes sparkle with life. He’s 67 years old, but he looks 10 years younger and has the energy of a young man and the enthusiasm of a boy. Leonard Knight has spent 14 years sculpting and painting Salvation Mountain in the California desert near Niland, in Imperial County, east of the Salton Sea, 200 miles from Los Angeles. The mountain is about as tall as a three-story building and as wide as a football field. It is covered with adobe and layer after layer of paint. County supervisors once labeled Salvation Mountain a “toxic nightmare” and tried to bulldoze it down. But supporters of the site rallied by sending letters and petitions. Knight himself had a set of soil tests made proving that no dangerous levels of hazardous materials were to be found there, and the supervisors dropped their campaign to get rid of Salvation Mountain and its creator. A car drives up and turns off the blacktop, bumps over the packed desert earth and stops a polite distance away from the truck with a house built on the back, where Knight lives with his cat. A man and a woman climb out of the car, and Knight hurries to greet them. They explain that they’ve come from Pennsylvania to see the mountain. “I’m surprised that we’re allowed to walk on it,” says the man. Knight and the couple reach the top and gaze at the painted mountain sloping away from them, down to the painted sea that surrounds it. “There’s so much to look at,” the woman says. “You can’t look at it all at once.” A soft breeze comes up, cooling under the hot sun. “It’s nice up here,” she says. “It must have been a lot of work,” the man says. Tina Fessey and Bob Sims arrive in Sims’ ‘80s-vintage Toyota pickup. The bed of the truck is tightly packed with five-gallon and one-gallon cans of paint. Bob Sims is in his early forties, quiet and thoughtful, long hair loose in back. “We drive up, and it’s like, ‘Hi, Leonard,’ and he’s already on his way to the back of the truck to look at the paint we’ve brought,” Sims says. “When people come in with paint, they have a great big smile on their faces because they know I’m gonna be excited about the paint. They know they’re going to get an enthusiastic handshake,” Knight says. Sims adds, “They have to pay to get rid of paint they can’t sell because it’s classified as hazardous. They can’t just pop it in a trash bin anymore, at least not legally." Salvation Mountain is the Interactive Mountain – an interactive work of art – a work of art that you can walk on and that keeps changing with your moving point of view. It’s a work of art with the artist in residence and still working, constantly making changes and additions, but always taking the time to welcome visitors and show them around, talking with them and listening to their comments. It’s people giving paint and getting beauty in return. It’s people giving love and getting love back in equal measure. It’s apprentices sharing the work as well as the fun. And finally, Salvation Mountain is a work of art that is constantly interacting with nature, mirroring the changing skies, reflecting the shifting lights and shadows cast by the desert sun. “Millions and millions of people are just plain beautiful,” Knight says. “If somebody gives me paint, they want to do it because they want to do it. They say, ‘We want to be part of the mountain.’ So people are doing it with their hearts. They’re helping me with respect I shouldn’t have. They give me compliments I don’t deserve. And, God knows, if people love me, I want to love them back.
. . . Man, the older I get, the more happy I get. It seems to me that good is getting better. I think that there’s something about being happy and enthused that makes a person young. At least it’s working that way with me. I just hope I last another 30 years because I got things to do.” Leonard Knight laughs and happiness dances in his eyes. In 2000, LEONARD KNIGHT’s Salvation Mountain in Niland, Calif., received a plaque from the Folk Art Society of America designating it as a folk art site worthy of preservation and protection. Directions from San Diego: (150 miles), East on Interstate 8 to El Centro, Route 111 to Niland, east on Main Street to the mountain. Leonard Knight's mailing address: P.O. Box 298, Niland, CA 92257. He likes to get mail. 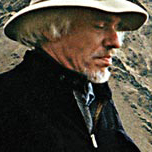 LARRY YUST is a filmmaker and photographer living in Los Angeles. The photographs for the Salvation Mountain article were taken recently and have never before been published. “The mountain constantly changes, and I can’t stop taking pictures of it,” Yust says.